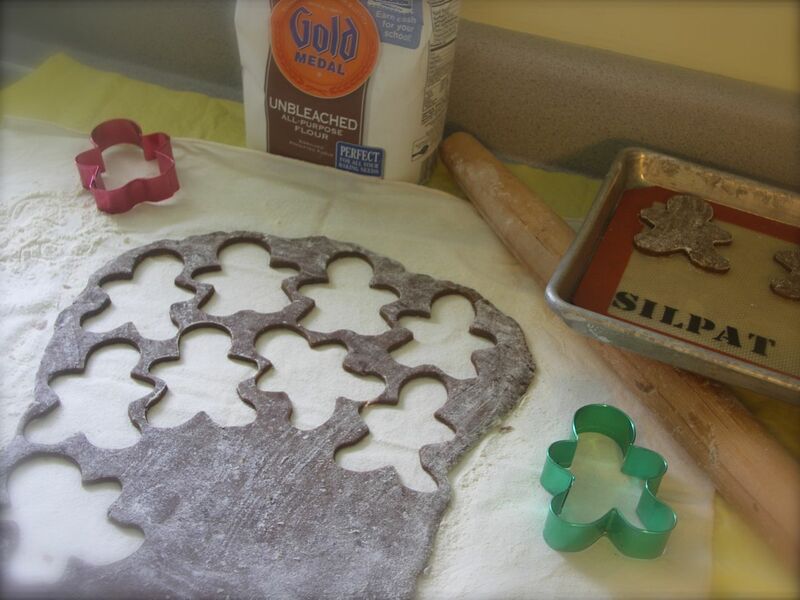 Ginger 02 Cheesecake (page 252) – cupcakes! 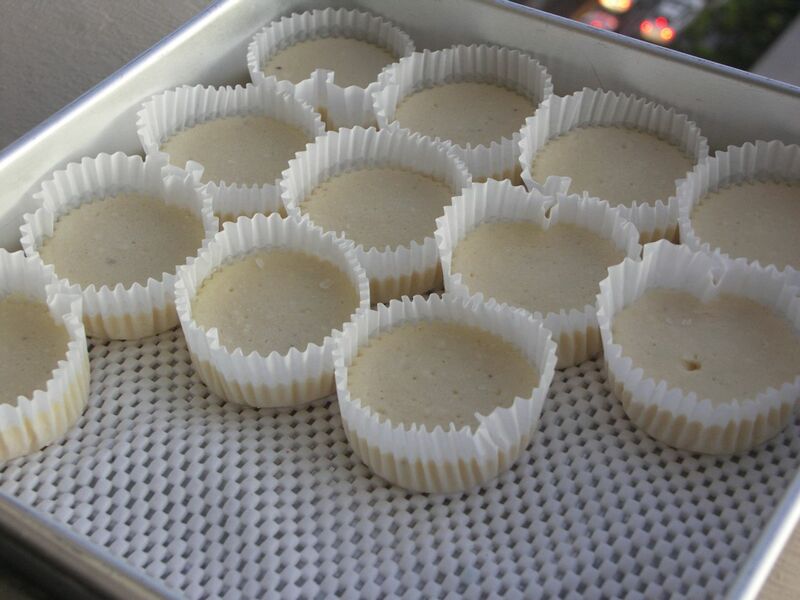 the best part i adore about ROSE’S heavenly CAKES: Ginger Cheesecake (page 252) -and in general all of Rose’s cheesecakes, as well as cakes not using leavening, and most all butter cakes that use leavening and bake on tube pans- is that you can turn them into cupcakes! p.s. these cupcakes are baked with the firmer variation, and indeed i have tested these are freezable! these crustless cheesecakes complimented very well with the gingerbread men cookies i baked and displayed on the table, for my Peruvian themed dinner. it was a little difficult to ask my guests to leave the men alone till the cheesecake was served! 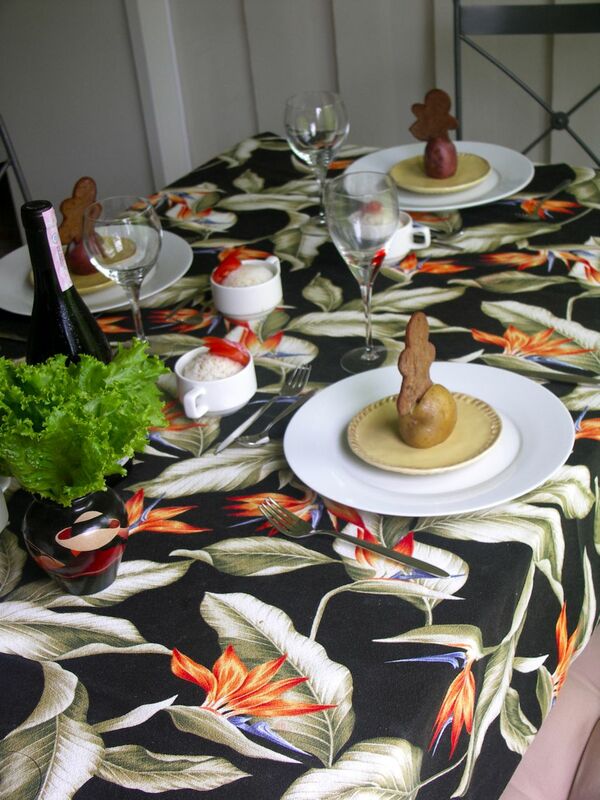 1- the table, in a way, we ran out of different plates for the many courses. 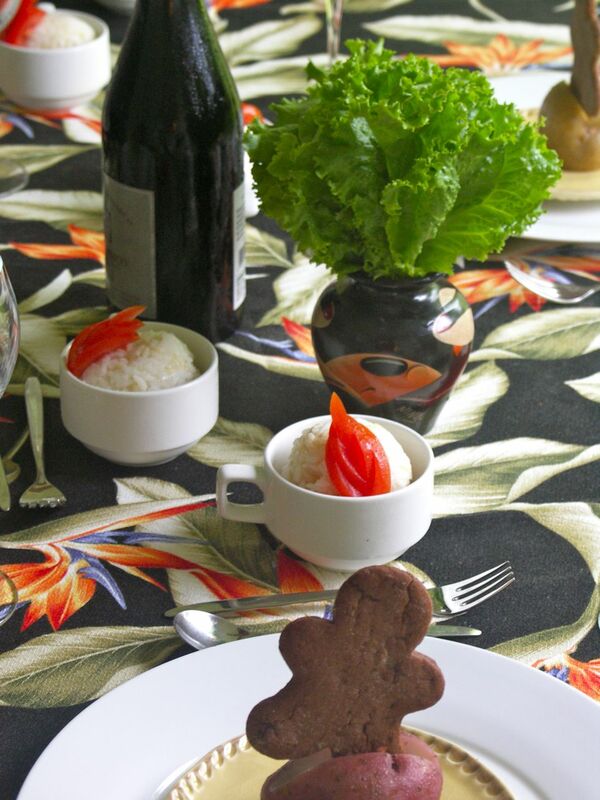 to save time plating and spend more time with guests, several plating components were displayed on the table from the beginning: gingerbread men for the ginger cheesecake dessert, hard boiled egg and bowl of rice for the aji de gallina entree, lettuce and corn for the ceviche. clever? 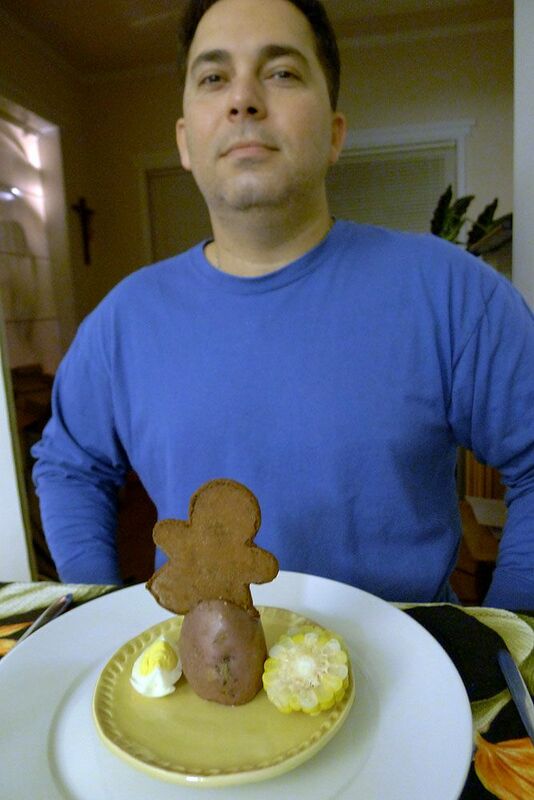 the potato ‘stand’ was there only to hold the gingerbread men. the potato was fully cooked and offered in the event a guest needed to eat more. 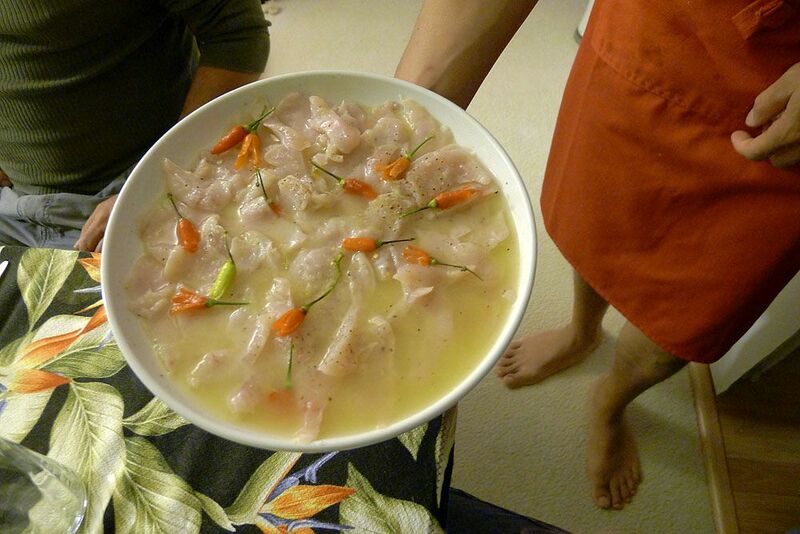 2- my ceviche, here sitting in lime marinade for only 10 minutes. loves it. 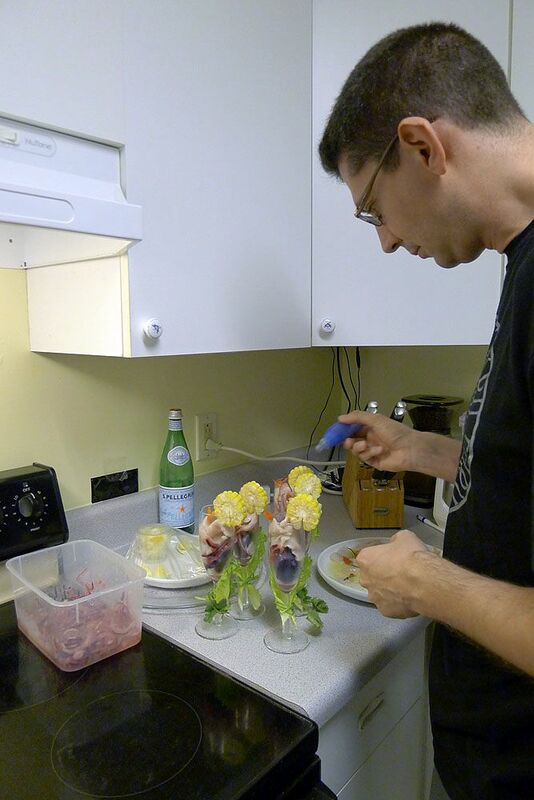 the hot peppers were slivered in fourths only on the tips, then soaked in iced water, so they would open like flowers. pls disregard my feet. 6- the happy creation. 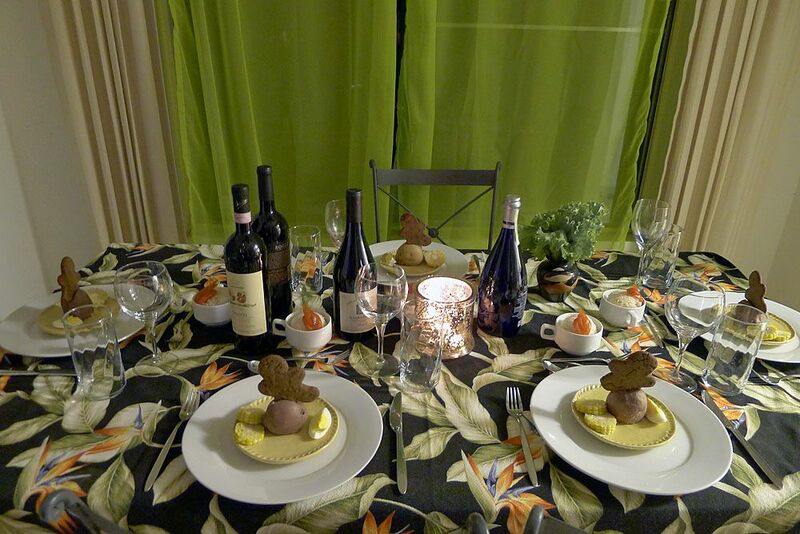 you need some ikebana and botany skills to wrap the lettuce and cilantro on the glass. 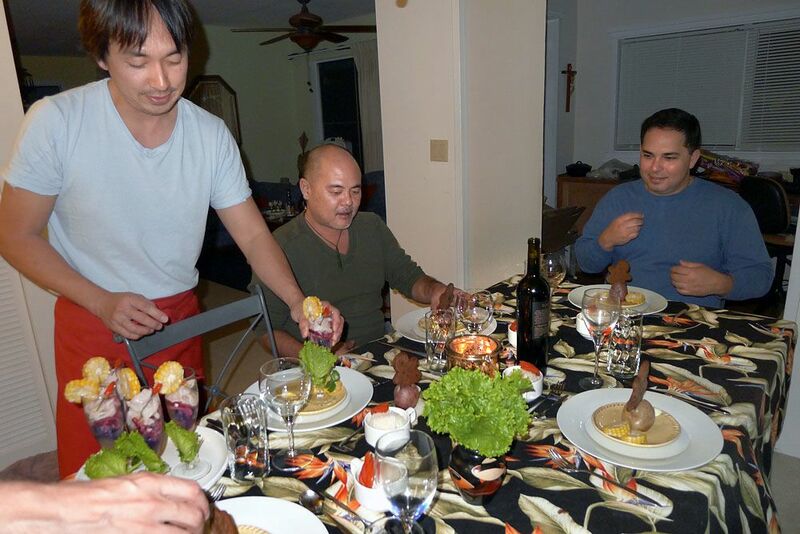 placing the sweet potato, purple, on the bottom of the glass was excellent: it is to be eaten at the end after enjoying the fish and the pickled onions; at this point the sweet potato becomes flavorful with the ceviche juices. 8- causa. peruvian potato salad stuffed with avocado and home canned tuna. because peruvian gold potatoes only grow in peru, i used okinawan sweet purple and okinawan sweet white potatoes (yes, such thing as a white sweet potato). the peruvian gold potato is 10 times more yellow than a yukon gold, 50 times more creamy, almost like butter; it is also on the sweet side. 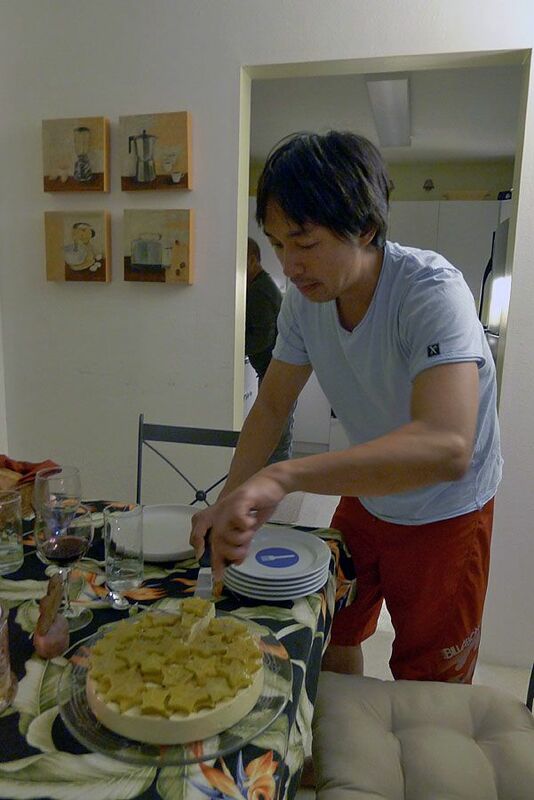 i found using okinawan potatoes a good substitute! just omit the sugar when you blend your hot chili sauce that is mashed with the potatoes. 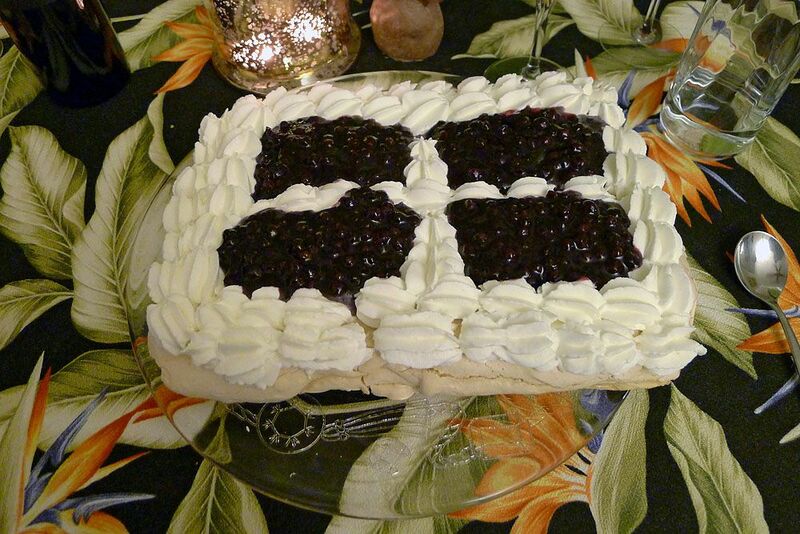 9- sorry for the confusion, this isn’t the ginger cheesecake. 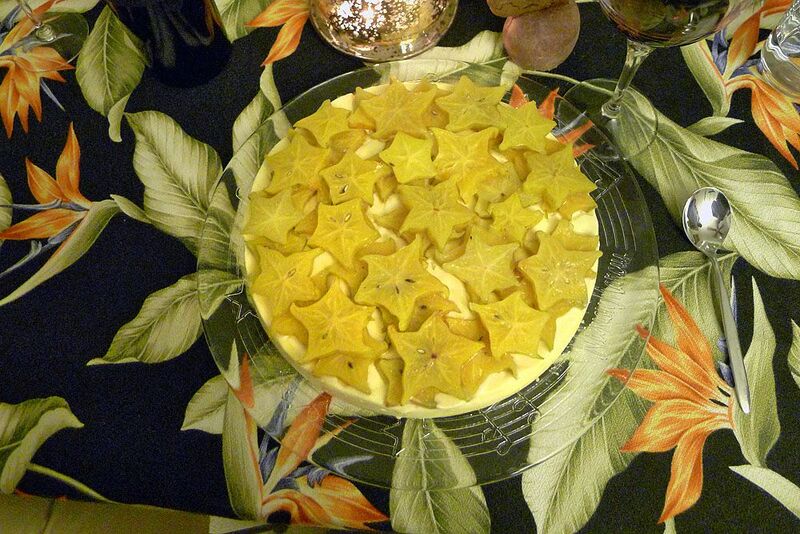 this is the starfruit bavarian cream, based on the Apple Caramel Charlotte. 10- i don’t suffer anymore cutting my creations, i enjoy sharing. but i do suffer and shake because i always thrive for perfect slices. it usually more than usual happens: perfect cutting. i hate people that use pancake turners to cut cake! 11- guest Randy brought pavlova with fresh blueberry topping. a very simple dessert to make if you are comfortable whipping meringue. pavlova is a favorite of many, and in my opinion it is a very elegant and delicate dessert. i can’t wait for hector’s take on pavlova! 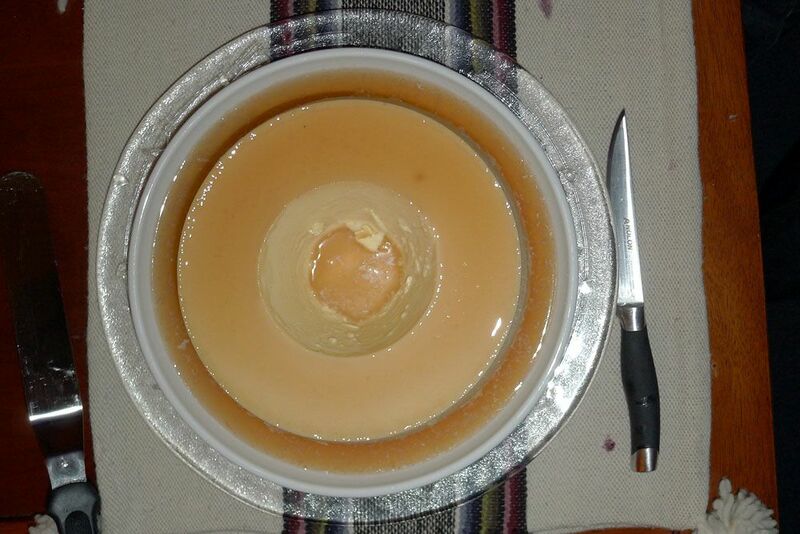 12- my ubiquitous perfect flan. always creamy, smooth, bubble free, yet it slices nicely. at this stage, each of my guests asked for insulin (we had a total of 4 desserts, on this 9 course meal. and unintentionally all desserts were flour less -gluten free. i have nothing against gluten and everyone should eat gluten, except i have one dearest friend who is celiac!). my usual mixing time for flan is 60 minutes, but with the beater blade, i cut the time to 10 minutes! the beater blade is that efficient emulsifying mixes; i was told the beater blade even reconstitutes frozen/thawed sourcream! i am getting the beater blade for the hobart 20 qt mixer, mostly for demos and to show off from any distance that i love the beater blade! Ginger cheesecake…that so sounds India, smile… What a feast Hector. What is the fruit served on top of the cheesecake?? Does not look familiar. thx S, was delicious. actually the ginger cheesecake was only cupcakes. what u are referring to is the apple caramel charlotte done with starfruit and cakeless. What a glorious meal, H! Your guests must have been thrilled. 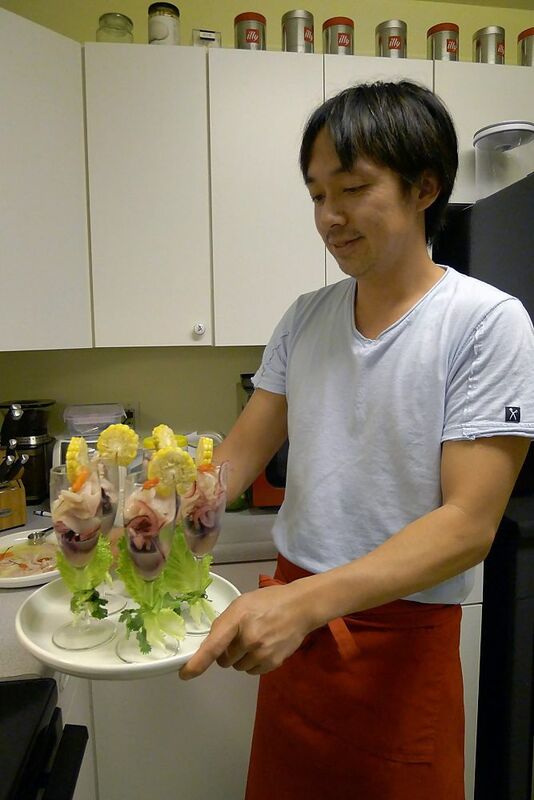 I love the parfait-style presentation of the ceviche, so beautiful. What’s in the purple-topped ring mold? How did the ginger cheesecake flavor taste with the star fruit? the J. I am thrilled! the purple ring is Causa, a Peruvian potato salad which I made from purple sweet potatoes and white sweet potatoes. Oh, star fruit, is it? Hav’nt seen it in these parts. OMG! Que dijeron tus invitados??? debieron quedar tumbados con esta delicia de platos!!! Te felicito por todo ese trabajo. Yo se que lo haces con mucho amor!. Esa es la única forma de hacer una cena tan especial, con amor!. un fuerte abrazo Ceci!!!! mi aura q me ilumina desde lejos cerca a mi pais natal! asu, sueno como un viejo! me demore 3 dias en cocinar para los 5 gatos! cada dia lo goze. H! Looks so awesome. Glad to hear your report on the ginger cheesecake as cupcakes. I have 4 cheesecakes still in the book to make and am considering making all as cupcakes (for less quantity). 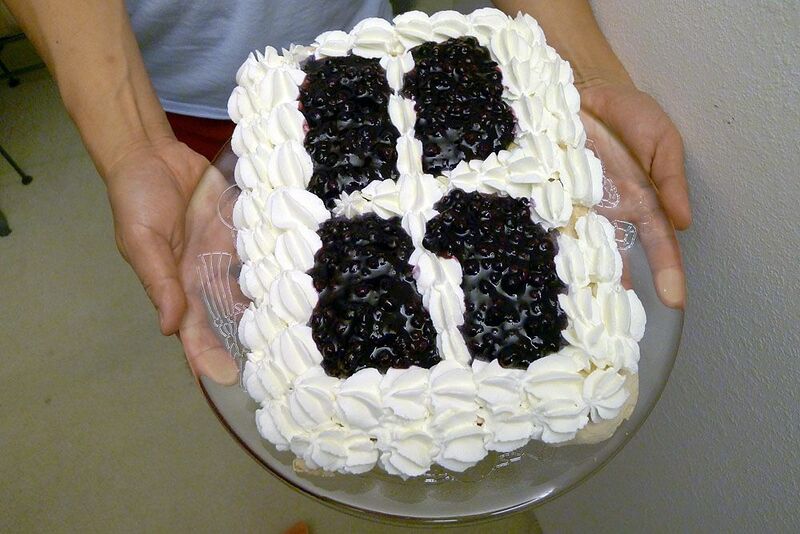 When I almost got to the end of your post, I was asking myself how many dessert you were serving, :). I’m looking forward to reading more details on each dessert. There will be posts about them, si? 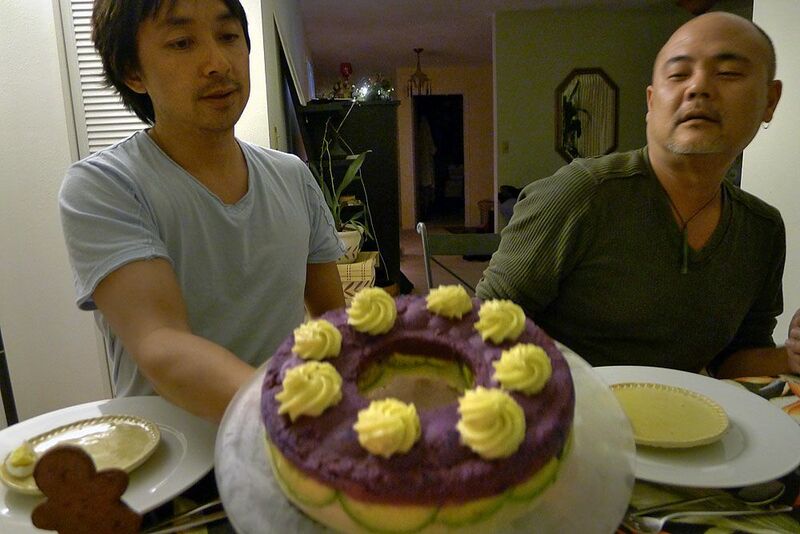 we served first the starfruit Bavarian cream (essentially, the apple caramel Charlotte wo cake and using starfruit). who can object to taste heaven first? fruity, refreshing, light, and heavenly billowy! is how i describe this delicate dessert with such high level of technique on the making! i also like to serve the Charlotte as my appetizer! then we ate the padlova. worked quite well as it was also light in texture. third was the ginger cheesecake. my food writer friend soniatasteshawaii.com had it for lunch the day before and she recommended i serve the ginger cheesecake last! the after taste, the lasting taste is really something to remember. i was planning on serving the flan as third dessert, but really: who can eat anything else after flan? there is no life after my flan! so i decided on the ginger cheesecake, been also a cupcake, and planning on serving the flan just prior the guests left home! a long break. so fourth, after a long break and chatter, and just prior kicking everyone out, the flan. ohhhhh, the flan. 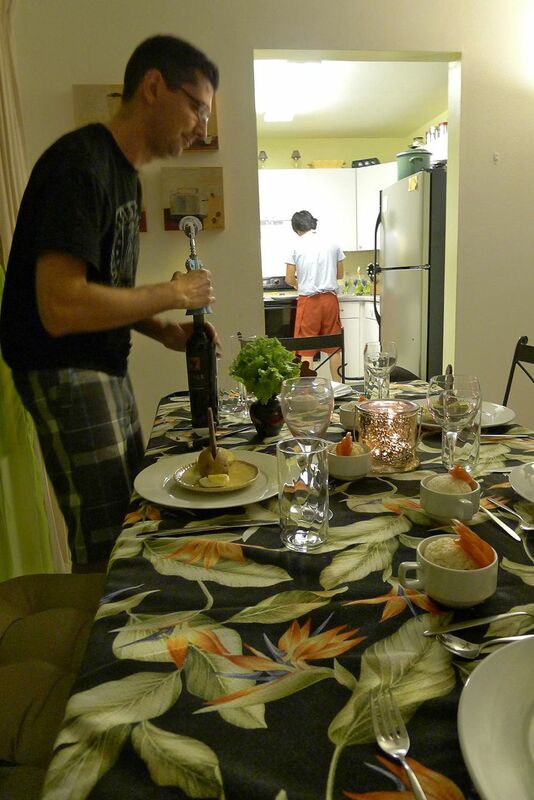 i unmolded it in front of my guests, and noone could resists it.